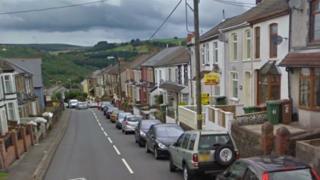 A woman was sexually assaulted as she walked in a road in Caerphilly county on Friday night, police have said. It happened in a lane off Bedwellty Road, near Pant Street in Aberbargoed at about 19:40 GMT. Officers described the incident as serious and said the victim was recovering at home, supported by specialist officers. Police have appealed for witnesses who may have seen the attacker. He was described as in his 30s, about 6ft (183cm) and skinny, wearing dark trousers, a dark jacket and black trainers with orange soles. Following the assault, he is believed to have run off towards the Commercial Street area of Aberbargoed.